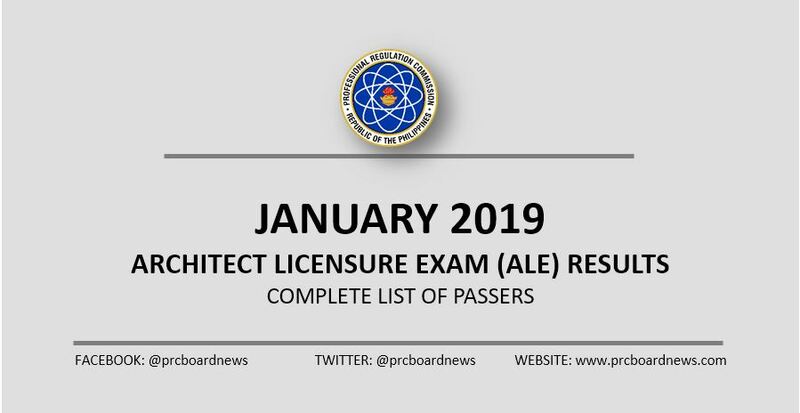 MANILA, Philippines – The Professional Regulation Commission (PRC) and the Board of Architecture (BoA) released result of January 2019 Architect board exam or Architect Licensure Examination (ALE) on Wednesday, January 30, 2019 or in three (3) working days after the last day of examinations. The official list of passers, top 10 (topnotchers), top performing schools and performance of schools are available on this page as announced online. PRC administered the licensure exam in Manila, Baguio, Cebu, Davao, Legaspi and Zamboanga on January 25 (Friday) and 27 (Sunday). The Board of Architecture who gave the licensure exam is composed of Arch. Robert S. Sac, Chairman with member, Arch. Robert M. Mirafuente. The two-day exam covered the following subjects: history and theory of architecture, principle of planning and architecture practice, utilities systems, structural conceptualization, building materials and construction, and architectural design and site planning. Based on PRC Resolution No. 1127, the target release date of Architect board exam result is on Wednesday, January 30, or in three (3) working days after the tests. In the January 2018 Architect board exam, results were released online after four (4) working days. A total of 1,126 out of 1,955 passed the tests. In the January 2017, results were out in five (5) working days. PRC named 919 out of 1,595 who have passed the exams. In the January 2016 exams, results were also released in 5 working days. A total of 866 out of 1,556 successfully hurdled the exams. What time is the release of result? Thank you. This is a very large list that will take quite a long time in order to fully process it for further analysis and work with it.